George Amos Tree Care Inc is a professional arboriculture company offering high standards in residential and commercial tree care. Approved Contractors for the District of West Vancouver, Municipality of Lions Bay, the City of North Vancouver and the District of North Vancouver. We are proud to have passed the strict criteria to be an Accredited Company of the Better Business Bureau. This is a great step for the business, allowing you, the client to know we are Insured and Experienced. Owner and principle operator George Amos has been working since 2006 as a professional arborist. Originally from England, he graduated from the University of Greenwich with a Bachelor of Science in Landscape Management and a speciality in Tree Care. He is ISA Certified, Tree Risk Assessor Qualified, Wildlife & Danger Tree Assessor and continues his professional education to keep up-to-date with modern arboriculture. George Amos Tree Care Inc is fully insured and licensed. All work is estimated by George and completed with a smile. We specialise in non-invasive spurless climbing. Here we are heading up into the crown of a Douglas Fir removing dead wood in West Vancouver. At a North Vancouver heritage home this Cypress tree was heavily leaning through phototropism towards a home. Installing dynamic cable bracing helps to reduce the risk of failure. Blessed to have a great friendly team of like minded arborists. We love the opportunity to work in remote locations. To date, we've been looking after trees in Indian Arm, Galiano Island, Salt Spring Island, Paisley Island, Bowyer Island, Anvil Island, Gambier Island, Vancouver Island and Pitt Lake. Tree work can be hard, but you need to have some fun. 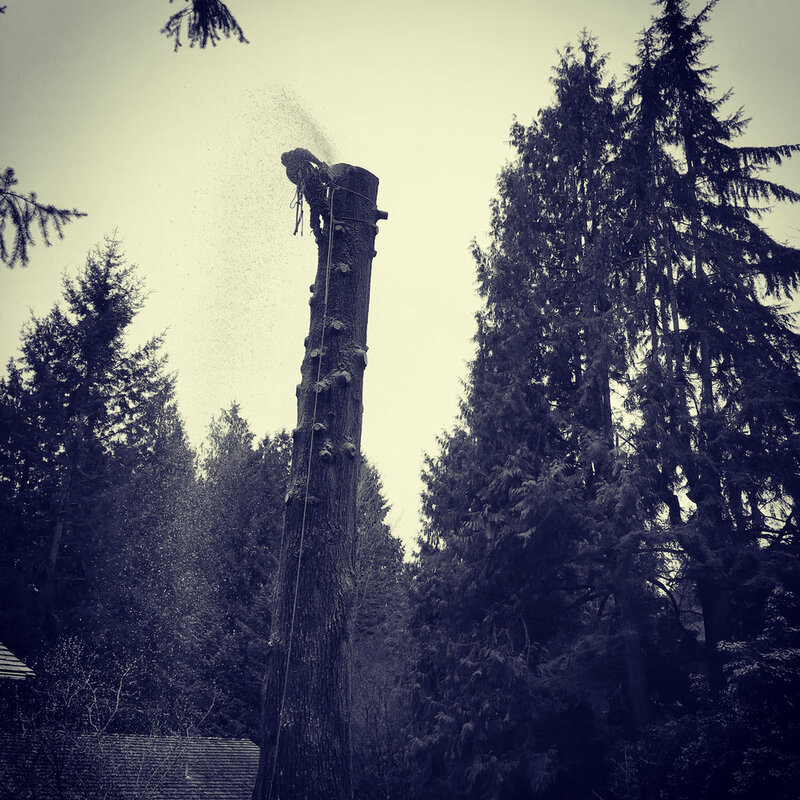 Removing a large declining Hemlock with extensive cavities in West Vancouver. Professionalism, Education, Accuracy, Safety and Knowledge are top priorities. We do not take short cuts in our work. Copyright 2016 George Amos Tree Care. Site by Small Forest Digital.